Ms. Cupcake » Our Charity of the Month is Viva! Ms. Cupcake > News > Cupcake News > Our Charity of the Month is Viva! Our Charity of the Month is Viva! We’re super happy to announce that our Charity of the Month for April is the amazing Viva! Viva! is on a mission to raise awareness of the horrors and environmental impact of factory farming while also supporting compassionate people to make the switch to a plant-based diet. 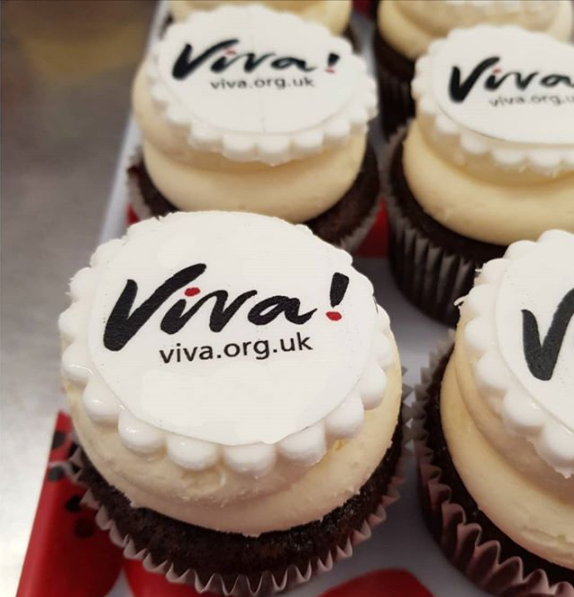 Throughout April, we will be offering cupcakes branded with the Viva! logo in order to raise awareness about the cause, with £1 from each sale going directly to the charity. You can find out more about Viva! by going on their website here. This entry was posted on Wednesday, April 4th, 2018 at 3:38 pm and is filed under Cupcake News. You can follow any responses to this entry through the RSS 2.0 feed. Both comments and pings are currently closed.